Once attacker gets the page source dropped into his textarea, he may begin to extract contents (like session IDs, user names, anti csrf tokens etc.) and launch further attacks. However, this way of using the vector requires significant effort from a user and is pretty difficult to exploit in real world situation (there's some clicking and dragging involved). Also, it will stop working once Mozilla disallows cross origin drag & dropping. The weak point of the 'classic' method for me was the dragging that was involved. In Firefox, once you drag something, it displays a shadow of the object at the cursor - and a whole HTML source being displayed for the user is really hard to hide. I decided to convince the user to copy & paste the source with his clipboard instead. Each of these steps requires user intervention. I could make a game/quiz that requires certain keypresses, but that's weak (although it works for Facebook users). Instead, I wanted it to feel natural for the user. Nothing is hidden and he just uses the clipboard because he wants to. So, when do you use a clipboard? Well, I don't like typing. So everytime I'm forced to repeat my e-mail address in a form, I just copypaste it. I decided to go that way. What if we display longish captcha-like 'security code' for a user to retype? 16 characters or more? Some of them will skip this step altogether, some will retype, but most will select the text and copy/paste. You can select with your mouse. In Firefox, you can also select by double / tripple clicking. My assumption is that most of the users use the clicking method to select text. Double click stops at word boundary, third click expands to whole paragraph (try this text). In the above example, you need three clicks to select the whole visible code. Why do we care? 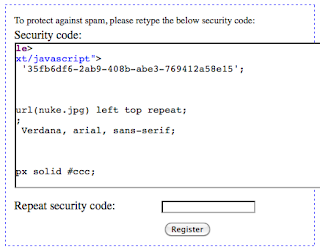 Because the security code input field is just precisely positioned part of the view-source:d victim page. 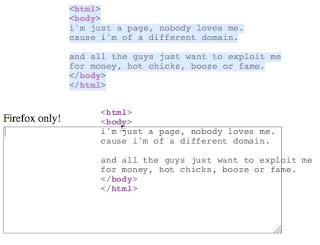 And by tripple clicking user selects the whole line from the page source! So we display the source in a small frame, position it to only display a few characters, starting from line 7, column 19. Then we convince the user to select the whole line with tripple click - double click will stop at minus sign, so the user will probably do the third click to select all. After selecting he copies, clicks the next field and pastes. Then we're done. How not to get owned? web developers - use X-Frame-Options header (js framebusting won't work here). Remember, once you allow your site to be framed, you're opening to a whole class of UI redressing attacks, most of the attacks are not even discovered yet, it's a new field of research. So if you don't use X-Frame-Options, better have a really good explanation. There's a new 'fake captcha' method of using the content extraction UI redressing vector. 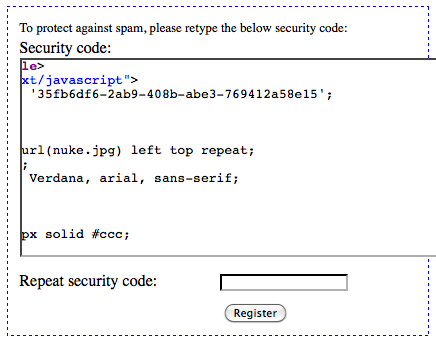 Update: Latest NoScript (2.1.2+) contains code neutralizing fake captcha method. Yeat another great work of Giorgio Maone! Update 2: Fake CAPTCHA technique spotted in the wild to extract Facebook CSRF tokens. I have learn some good stuff here. Definitely price bookmarking for revisiting. I surprise how a lot attempt you set to create any such great informative website. Hey, I think your website might be having browser compatibility issues. When I look at your blog in Safari, it looks fine but when opening in Internet Explorer, it has some overlapping. I just wanted to give you a quick heads up! Other then that, great blog! When I tried to read the token from 63rd line, it does not work. What could be the reason for that limitation ? The problem is fixed after modifying the iframe height value in the outer.html. Thanks. Double your claimed satoshis with this advanced BTC FAUCET ROTATOR. Did you think about choosing the ultimate Bitcoin exchange company - YoBit.